The Hawaii Supreme Court will hear oral argument on Thursday, December 2, at 10 a.m. in the Ronald T. Y. Moon Judiciary Complex in Kapolei. It will be the first time the Supreme Court convenes in the Hawaii State Judiciary’s newest facility, which opened to the public in May 2010 and houses the First Circuit Family Court, Juvenile Detention Center and Waianae District Court. The ICA’s opinion may be viewed online. Also, a brief description of the issues being challenged and the names of the justices hearing the case and attorneys involved are on the Judiciary’s website. Other than once or twice a year when oral argument is heard at the William S. Richardson School of Law, the Supreme Court and ICA hear oral argument in downtown Honolulu in Aliʻiolani Hale. 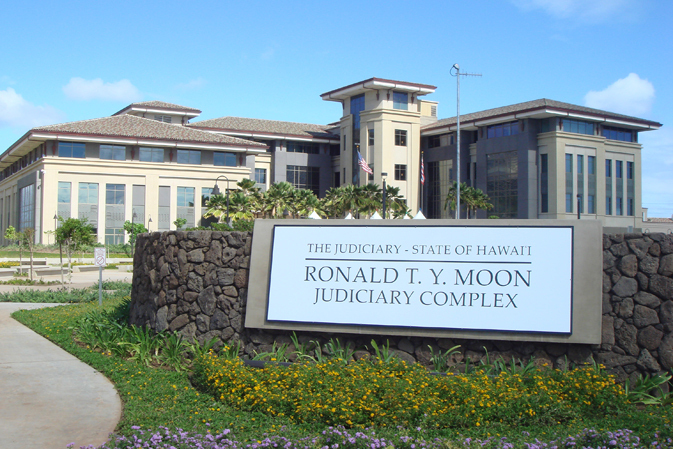 “By holding a session in Kapolei, the justices and I hope to make the court more accessible to people who live and work on the west side of the island, as well as to the members of the family law bar who practice in Kapolei,” said Chief Justice Mark Recktenwald. The court would like to hold more arguments at the Ronald T. Y. Moon courthouse, and plans to hear argument at the William S. Richardson School of Law early next year. Photo courtesy Hawaii State Judiciary.